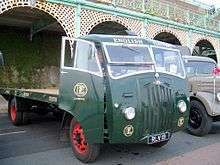 Jensen Motors Ltd was a British manufacturer of sports cars and commercial vehicles in Lyng, West Bromwich, west of Birmingham England. Brothers Alan and Richard Jensen gave the new name, Jensen Motors Limited, to the Lyng commercial body and sports car body making business of W J Smith & Sons Limited in 1934. It ceased trading in 1976. The rights to Jensen's trademarks were bought with the company and it briefly operated in Speke, Liverpool from 1998 to 2002. Under subsequent owners, a new version of the Jensen Interceptor was announced in 2011. It was planned to bring manufacture of that new model back to the former Jaguar motor plant in Browns Lane, Coventry. 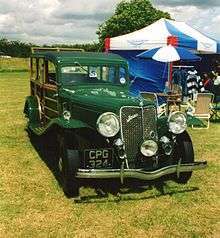 Production of cars ceased during the war years, but by 1946 a new vehicle was offered, the Jensen PW (a luxury saloon). Few were produced since raw materials were carefully limited by the new government's central planning. 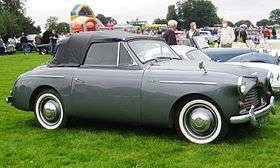 Also in 1946 body designer Eric Neale joined Jensen Motors from Wolseley and his first project was the more modern coupe which followed in 1950, named the Interceptor, which was built until 1957. In 1955, Jensen started production of Neale's masterpiece, the 541, which used the then-revolutionary material of fiberglass for its bodywork. The 541 was replaced by another Neale design, the CV8 in October 1962, which replaced the Austin-sourced straight-6 of the previous cars with a 6-litre American Chrysler V8. This large engine in such a lightweight car made the Jensen one of the fastest four-seaters of the time. For its eventual replacement, the Interceptor, Jensen turned to the Italian coachbuilder, Carrozzeria Touring, for the body design, and to steel for the material. 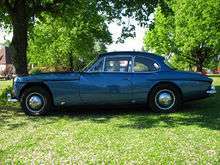 First displayed alongside the production CV-8 FF in October 1965 and put into production in the second half of 1966 the bodyshells themselves were built by Vignale of Italy and later by Jensen. The same 383 cu in (6.3 L) Chrysler wedge-head powerplant was used in the earlier cars with the later cars moving to the 440 cu in (7.2 L) in engine. 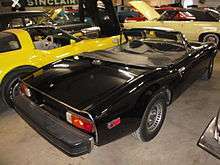 The Interceptor was offered in fastback, convertible and (rare) coupé versions. The fastback was by far the most popular with its large, curving wrap-around rear window that was hinged for access to the storage area, making the Jensen an early form of liftback. Austin A40 Sports: As one in a series of collaborations between Austin and Jensen, the Austin A40 Sports originated when Austin's chairman Leonard Lord, upon seeing the Interceptor, requested that Jensen develop a body that could use the A40 mechanicals. Sunbeam Tiger: In the early 1960s Jensen were also involved in the development and production of the Sunbeam Tiger. In April 2010 Jensen International Automotive (JIA) was founded. This new company will buy old Jensen Interceptors, and sell them as new ones after a complete restoration, with new engine and interior trim. 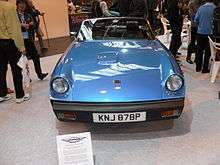 In September 2011 CPP, a specialist sports car manufacturer announced they were planning to make a new Jensen, expected to go on sale to the public sometime in 2014. The new Interceptor will be based around an all-aluminium chassis and will feature alloy panels, "echoing the four-seat grand tourer layout of the much-loved original", according to the official press release. 1 2 3 4 "Jensen To Produce Car With Four-Wheel-Drive". The Times. London, UK (56152): 6. Oct 26, 1964. 1 2 3 4 Georgano, N. (2000). Beaulieu Encyclopedia of the Automobile. London: HMSO. ISBN 1-57958-293-1. ↑ Norman Mort. Anglo-American Cars: From the 1930s to the 1970s. p. 15. 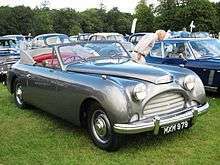 1 2 "Motoring Memories: Austin A40 Sports, 1951–1953". Canadian Driver, June 15, 2007, Bill Vance. ↑ "Jensen Cars". Wolverhampton Museum of Industry. ↑ "Austin A40 Sports". Austin Memories. ↑ "Those were the days". Expressandstar.com. Retrieved 2012-01-05. ↑ Kennett, Pat, ed. (September 1982). "What's New: Budget-price pick-up". TRUCK. London, UK: FF Publishing Ltd: 11. 1 2 Dron, Tony (2003-06-14). "The tragic tale of the Jensen S-V8". London: Daily Telegraph. Retrieved May 6, 2010. ↑ "Jensen roars back". BBC News. 12 October 1999. Retrieved 10 October 2012. ↑ Dron, Tony (25 August 2001). "New Jensen S-V8 enters production". The Telegraph. Retrieved 10 October 2012. ↑ Knapman, Chris (20 September 2011). "New Jensen Interceptor to be built in Britain". The Daily Telegraph. Retrieved 5 January 2012.